Pro Ride Snowboard Camps offer Instructor training courses lead some of Canada's most qualified CASI instructors and evaluators. 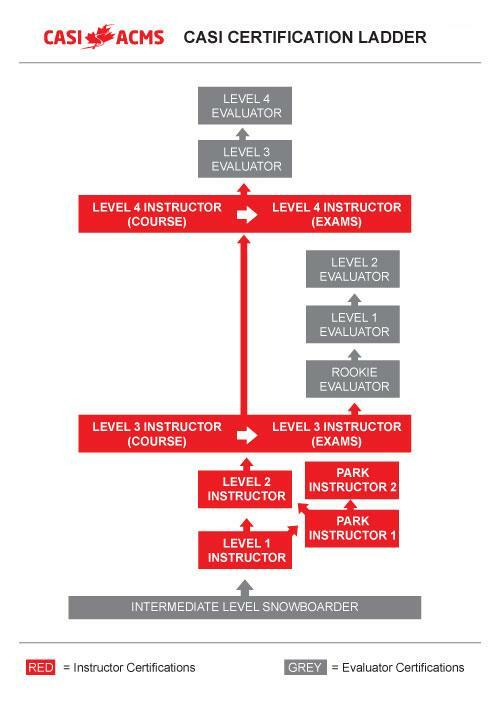 Prepare and train for your CASI levels 1, 2, 3 and Park Instructor levels 1 & 2. Our snowboard Instructor courses will develop your riding and teaching skills to the level required to successfully complete your CASI qualifications (Canadian Association Snowboard Instructors). We will fine tune your riding and bring you step-by-step through the teaching progressions. When training with Pro ride you have the flexibility to choose how long you would like to train as well as how you would like to combine your instructor training. You have the opportunity to spend either more time riding freestyle or more time freeriding based on your personal riding goals and course length. It’s up to you. For current dates & Prices visit our 4-12 week course page. The level 1 instructor course and exam is an entry level program designed to train and qualify you to teach beginner to intermediate lessons. The course focus is on improving and understanding the CASI snowboard technique, lesson planning, effective communication skills and the level 1 teaching progression. The program will also provide plenty of time for fun in between for personal rider improvement such as steeps, trees, powder and jumps. A minimum of 4 to 6 weeks training is recommended depending on your current skill level. Once you have completed the Level 1 snowboard instructor course, the next step in the progression is the CASI Level 2 certification. This certification allows you to teach intermediate to advanced riders and we recommend a further 4 to 8 weeks of training to pass the exam. The focus of the level 2 program is to develop your advanced riding skills and learn how to analyze and improve your students using a skill-based teaching strategy. A high level of class communication, technical analysis and group management skill are required to pass the exam stage and students must be able to ride on advanced terrain and carve controlled turns on intermediate terrain. During this program you will have to opportunity to advance your own riding skills to advanced/expert level on all terrain. If freestyle is more your style, Pro Ride can train you for the CASI park instructor certification. In this course you will focus on learning basic freestyle skills, and how to teach introductory freestyle lessons in the terrain park safely. Campers will also get the opportunity improve on their personal intermediate to advanced freestyle skills in all 5 terrain parks over Whistler and Blackcomb Mountains. Once you have passed the exam you will be certified to take students into freestyle terrain and teach basic manoeuvres on beginner terrain park features. Note: The CASI level 1 certification is a prerequisite. "Big thanks to Karen, Duncan, Tim, Lisa, Alan and other instructors sharing their wisdom and helping to get my riding to the next level! From level 1 instructor to shredding pow in Mt Baker to huckin backies in 7th heaven, truly unforgettable! Cheers to all campers for awesome chillin and riding times, you will be missed. Thank you whistler, hope to make it back next season!" WHAT ABILITY LEVEL DO I NEED TO BE TO TAKE AN INSTRUCTOR COURSE? To successfully complete a four week Level 1 instructor training course you should have 40+ days of riding experience. However, if you have fewer days' riding experience do not despair as we can still prepare you for the certifications. It is best to speak with us directly so that we can determine your ability level and recommend the best option for you personally. No matter your level, we can help you achieve your goals. NB: The Level 1 Certification exam fee is included in all 10 & 12 week courses so no need to select this upgrade when registering for these courses. WHAT'S INCLUDED WITH THE INSTRUCTOR EXAM FEE? "Thanks heaps for the month i was there, learnt loads and had awesome awesome time. Say gidday to troy and the gang and anyone in the house that I knew, and ill be seeing you guys for a beer in the next cracking season cheers dickie "
"If it weren't for the expert level of tuition and constant feedback on my progress at the 12 week camp I attended, then there is no way (in my opinion) I would of attained both my level 1 and 2 CASI certifications. I am very grateful to Pro Ride." CASI stands for The Canadian Association of Snowboard Instructors and was formed in 1994 and is the professional snowboard teaching body in Canada.